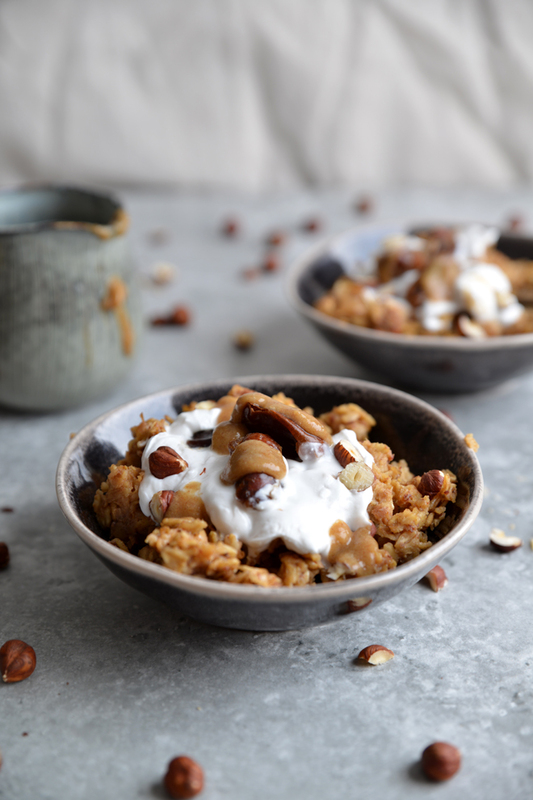 What’s a winters Sunday without an elaborate porridge recipe! It’s been pretty cold here recently and the frosty mornings are in full swing; there’s something about a frosty morning that makes me so happy inside, it just looks so magical. So Sundays mean cosy pyjamas, hot chocolate and a warm breakfast in front of the Christmas tree. I’m back doing that thing again where I want to put every flavour into one dish, I went on a binge making every flavoured porridge possible recently and this was one of my favourites. There’s nothing like a nice big gooey slice of sticky toffee pudding in the winter so what’s better than having it for breakfast instead of dessert. Obviously I’m not proposing we eat pudding for breakfast...maybe in a couple of weeks I will be, but at least this is all the flavour with none of the sugar crash. 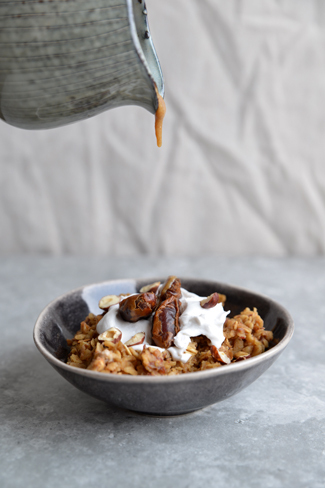 Yes I managed to make a sticky toffee porridge which is gloriously ooey and gooey in all the right ways without using sugar, I think I’ve only just fully realised the joys of dates because I swear I put them in everything at the moment! I guess this is a very heavily modified version of the way I make sticky toffee pudding all rolled into a nice little bowl of porridge, soaking the dates in the tea gives it that full sticky toffee flavour, plus the fact it gives you a little extra caffeine kick in the morning if you need it. Finely chop the dates and place in a saucepan, I find the easiest way to do this is with a pair of scissors, add in the milk, water and the tea bag then slowly bring to the boil and simmer for about 5 minutes. 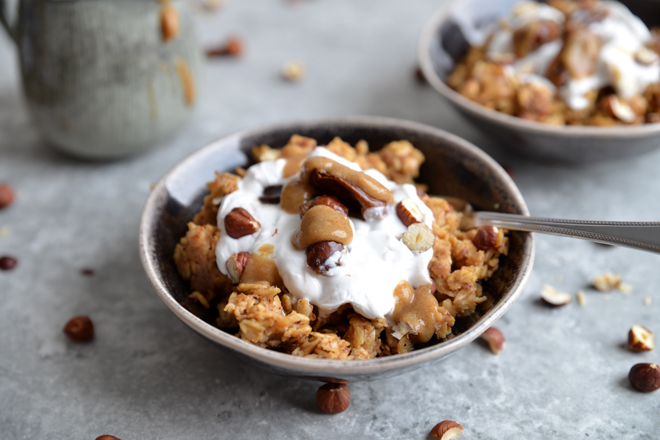 While the dates are simmering, melt the coconut oil in a small frying pan on a low heat, add in the oats and stir until the oats are coated with the oil then slowly stir until slightly toasted and fragrant. Once the oats are toasted and the date mixture has simmered for a while, take the saucepan off the heat, remove the tea bag and stir in the oats. Place the lid on the saucepan and leave to rest for 10-15 minutes. 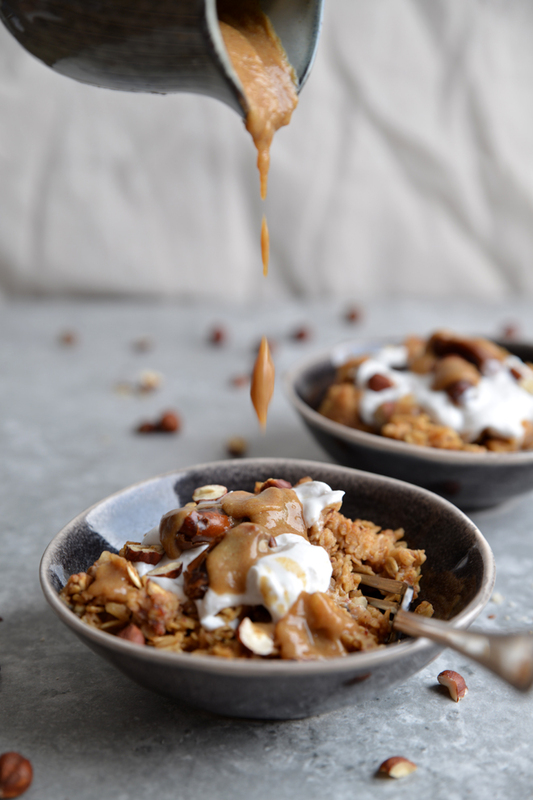 While the oats are resting make the toffee sauce by blending the dates and milk together, you may need a little more than ¼ cup of milk just add enough until it creates a pourable consistency. You can heat this in a saucepan or in the microwave before serving. 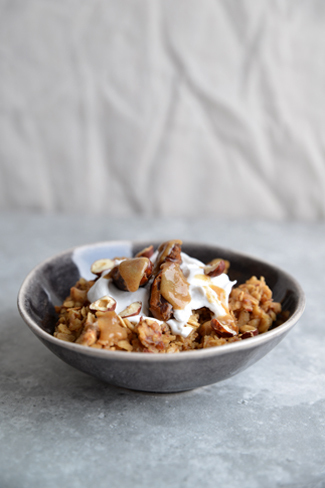 Once the oats have rested, spoon into bowls, top with coconut cream, chopped nuts, dates and drizzle over the sauce. YUM! 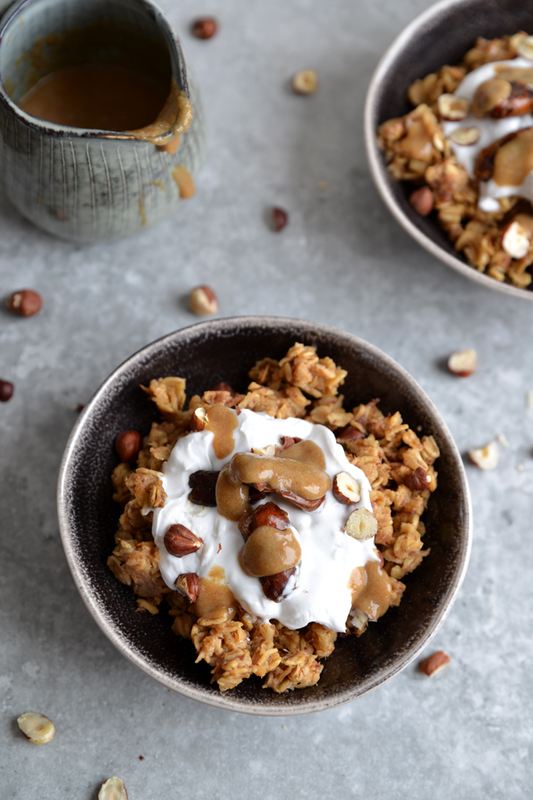 This porridge looks so good, comforting and delicious! I can't wait to try it for breakfast in the weekend. Thanks Natalie, hope you enjoy! What a creative way to eat porridge! Great recipe.